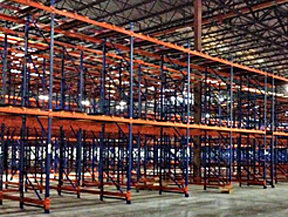 Push Back Pallet Racking Systems operate similar to pallet flow rack in that they are also designed to utilize the naturalforce of gravity to move the pallets within the system; but that is where the similarities end. 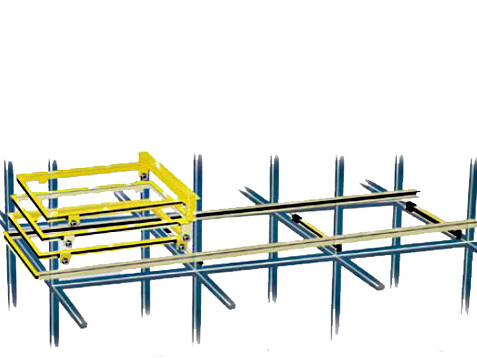 Push back rack works byplacing pallet loads on a series of nesting cartswhich arefed forward by gravity on rigid structural steel rails. 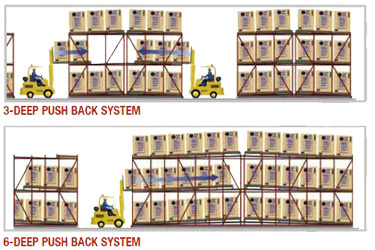 As a palletis loaded from the front of the rack system onto a nesting cart, it pushes the pallet behind it back one position. Thereverse happens when you unload the front pallet, the pallet behind it willautomatically move forward to the frontpicking position. 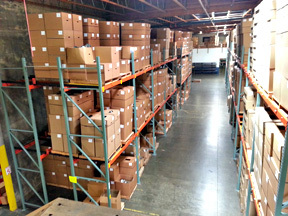 This type of system is called Last-In-First-Out (LIFO) inventory management. 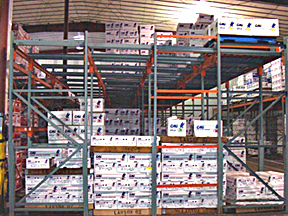 Typical systems can store pallets2-6 deep,with front-only loading and unloading from a single aisle.Unlike Drive-In pallet rack, the driver never enters the palletrack system, and each lane, and each level, flow independently of each other, allowing you to store a variety of SKU’swithout disturbing product in the other lanes.Push back rack systems can be installed against a wall and operated as asingle-sided system, or located in the middle of an area and operated as a double-sided system. 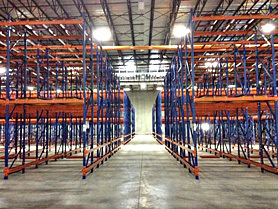 Because each lane flows independently, push back pallet racking allows you to storemore pallets, but with betterselectivity than drive-in pallet rack. 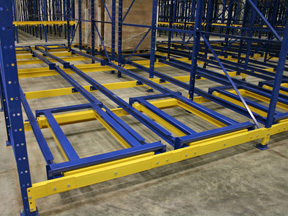 Compared to standard selectivepallet rack, push back racking can save you up to90% storage space. 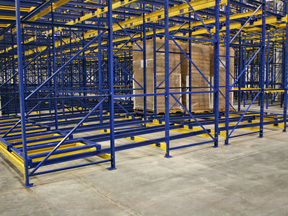 The main component of push back pallet racking is the carts. The cartsare moved along the inclined rails by gravity,with the rails being adjustable vertically to control the pitch.The carts neston top of each other and slide back onepallet position when a new pallet is added, and slide forward one position whenone is unloaded. Each pallet has itsown cart, with the last pallet resting on the rails running the length of the bay. Each cart is equipped with four wheelsallowing them to flow smoothly along the rails. As each pallet isunloaded,all pallets behind glide forward gently untilthey come to rest on the rubber bumpers at the front of the pallet rack system. 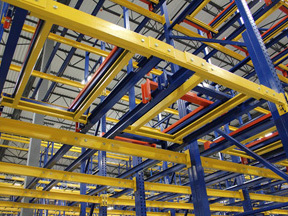 Because the LIFO stock rotation of push back pallet racking systems is automatic, and pallet loads are easily accessible,push back is an ideal high occupancy storage application. 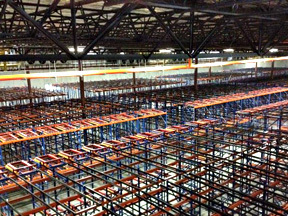 High density storage utilizes warehouse space with fewer aisles. Low profile, nesting cart system allows for maximum storage height.